Talk Radio to Inspire. Inform. Stimulate. Seattle’s Conversations LIVE with Vicki St. Clair is an award-winning radio show sharing stories that inform, inspire, and stimulate, helping people to live well–live strong. You’ll hear from innovative business and thought leaders, cutting-edge medical researchers and health professionals, #1 NYT bestselling authors, Academy winning filmmakers, National Geographic explorers, Pulitzer Prize and award-winning journalists, adventurers and travelers. And together we’ll explore the challenges of the human spirit by recognizing ordinary people, leading extraordinary lives. Voted the #1 Weekly Show for the 8th consecutive year, Conversations Live with Vicki St. Clair is broadcast live from Seattle’s KKNW am1150 & FM 98.9 HD3 (Hubbard Radio) and simulcast to over 192 countries. Airs Mondays at noon PT / 3:00 pm ET & Fridays during prime drive time, 6:00 am PT / 9:00 am ET. Vicki launched Conversations LIVE in 2007, following three years with PCTR/Sandusky Radio and the Vicki St. Clair Interviews. Working from KKNW’s state of the art studios at Hubbard Radio, Conversations LIVE has a small but dedicated team behind the scenes. 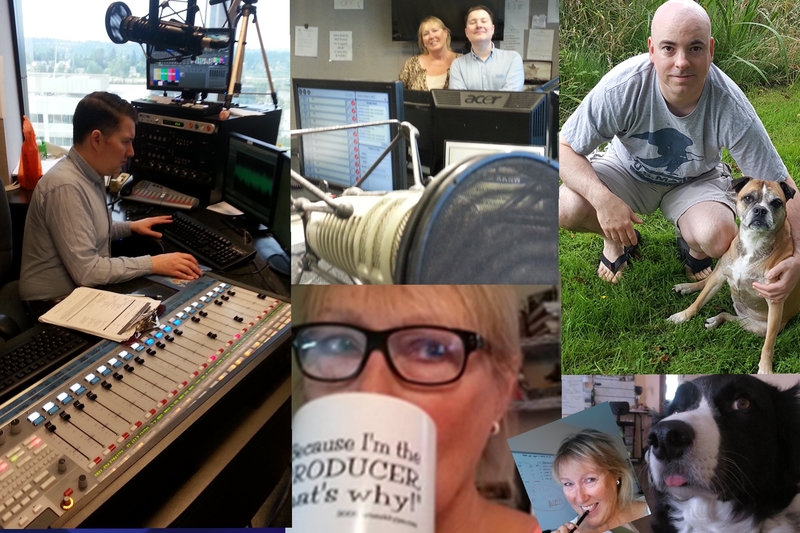 For the 11+ years Conversations LIVE has aired, KKNW Studio Producer, Eric Reidar, has been the talent behind the show’s audio quality, and the guy who keeps us LIVE on-air. Doesn’t matter how unusual the topic of the show is, Eric always finds bumper music to fit. He’s now also the station’s Operations Manager. And often plays venues around Seattle with his band. Meet also, the unflappable David Vandver, Associate Producer/Writer (with Ms. Zoe the boxer). Although he and Vicki have met only once, David’s been writing guest blurbs and updating the website show schedule for the past eight years. In addition to writing screenplays, David’s done standup comedy … which explains why his late-night, rambling emails are often hilarious. Oh, one more. Border Collie, Dylan Thomas, Vicki’s VBFF (very best furry friend). He hangs out at Vicki’s writing studio every day and keeps things calm when deadlines loom. Vicki St. Clair is a Storyteller — An Award-winning Writer, Producer, Communications/Media Professional. It’s ALL About People & Their Stories. For almost 20 years Vicki has worked in the US and Europe successfully writing, directing, and producing an extensive range of editorial, broadcast, and commercial projects. Her writing extends to national and international publications, including New York Times, USA Today, and London Times bestselling anthologies. Vicki is privileged to work on a diverse range of projects with many talented professionals and dynamic organizations. Some have included: ITV-UK, National Geographic, Channel 4, BBC, Dorling Kindersley, BCTV Canada, WNET, WETC, Overseas TV, PBS, NPR, Penguin Press, Vogue, Self, Shape, More, Cosmopolitan, RealNetworks, Walt Disney, Amazon, Microsoft, Citigroup, WA Schools, Sony, Intel, Citigroup, Simon & Schuster, Doubleday, Hyperion Publishing.